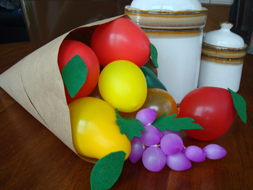 Have the kids celebrate the season by making their very own Balloon Cornucopia! This is a super fun craft that makes a great table centerpiece or homemade decoration! Make sure you tie your balloons tight and keep in mind the your fruit may deflate a little, so don't make it too far ahead of time! 1. Make a cone shape with a piece of brown package paper or paper bag. Use scotch tape to secure your paper so you can't see it. 2. Blow up your balloons, only a little bit, until they are the size of real fruit. We used regular 9" balloons to make our apples, oranges, lemons, and pears. We used small purple water balloons to make the grapes - if you can't find tiny balloons you could also make purple plums! 3. Use masking tape to stick your balloon fruit into your paper cone. Try and hide the "tie" end of the balloons inside the cone. You can use masking tape to stick the fruit to the cone and to each other. 4. Cut green leaf shapes from felt or paper and glue or tape onto the fruit that's showing outside the cone.